The five of us laid out under the open sky in Vermont. We had just visited the arcade at the campground and we were on our way back to the RV when someone noticed just how much of the sky we could see. The stars stretched across the vast, night tapestry. As we watched the stars slowly make their way across the sky, we all agreed that we felt the majesty of God in that moment. It was the closest to an actual presence that I’ve ever experienced. On the Friday nearest to the fourth of July, the race track just across the street from my grandparents’ house would have a huge fireworks display. My family would meet at Gram and Kack’s for dinner, and then my sisters and I would run around their yard, catching fireflies, watching the fluorescent yellow light illuminate our hands. As the darkness settled in, it became harder to catch the bugs, because you could only see them for the moments when they lit up, but looking out over the yard, you could see hundreds of the tiny beetles, communicating their mating calls in one of nature’s most magical ways. As dusk transitioned to night, the more beautiful the scene. Later, we would gather together as a family, marveling at the green and red and blue fountains that would light up the sky. We would exclaim that this or that one was our favorite, but the truth is, we loved all of them because they were all beautiful. The darker the night, the more clearly we could see the fireworks and the more we could appreciate their beauty. I don’t really disagree with the quote, but it feels incomplete to me. I definitely do not have the latter kind of faith (and I wholeheartedly agree with Frederick Buechner that those who don’t have doubts are either kidding themselves or are asleep), but I don’t have the former, either. My faith and my doubts stare at each other all the time, and I think they take turns blinking. The tension between my faith and my doubt is a near constant. It has been, to greater and lesser degrees, for as long as I can remember. Darkness has nearly always been a part of my faith walk. There are some for whom that is a frightening possibility. Darkness lends itself to confusion. Darkness is where the monsters hide. But there are advantages to darkness as well. Stars are in the sky all day long, it’s only at night when we can see them. Fireworks can be set off any time, but their beauty is amplified when the sky is black. 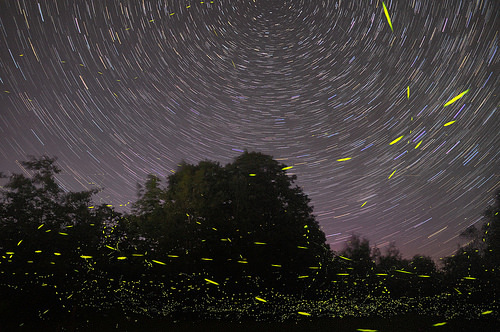 Fireflies begin their light show in the late part of the day, but it’s only in the cover of darkness that we can fully appreciate their magical qualities. In doubt’s darkness, small spots of light shine more brightly. Pinpoints of hope become beacons. They may blink in and out of existence, but those flashes are beautiful. They remind me and other doubters that life exists and even multiplies in the midst of the darkness. This entry was posted in Faith and Doubt and tagged doubt, faith. Bookmark the permalink.